President Joko Widodo (Jokowi) expressed his wishes to undertake soon a number of infrastructure projects, like Trans Sumatra roads, Trans Sumatra railways, Kalimantan toll roads, and Kalimantan railways. He even wanted to realize his wishes as soon as possible and he demanded that such projects must start next year. “In Lampung yesterday, I summoned the ministers, like the Minister of Transportation, the Minister of Public Works, and the Minister of State-Owned Enterprises. We have pointed the locations and made the decisions. The projects must’ve started in next February,” President Jokowi said when he was delivering his general lecture in front of Yogyakarta Gadjah Mada University’s (UGM’s) community of scholars on Tuesday (8/12). President Joko “Jokowi” Widodo acompanied by The First Lady Iriana Widodo head to Busan on Wednesday (10/12) morning, to attend ASEAN-South Korea Summit. The President and delegation fly with Presidential aircraft depart from Halim Perdanakusuma airport at 07.00 AM. There, seen to have released the delegation were Vice President Jusuf Kalla, Coordinating Minister of POLHUKAM Tedjo Edhy Purdijatno, Coordinating Minister of Maritime Indroyono Soesilo, TNI Commander General Moeldoko, Head of State Police General Sutarman, and Governor of Jakarta Basuki Tjahaja Purnama. Taking advantage of his visit to Gorontalo, President Joko Widodo (Jokowi) took time to go on ‘blusukan’ to the location of Gorontalo fish market on Saturday morning (6/12). The President who was accompanied by First Lady Iriana Widodo arrived at 08:15 WITA or 07:15 WIB and saw the process of fish trade at Fish Landing Base (PPI) at Gorontalo Tent. Hundreds of people had crowded the sidewalk. People lined up neatly and did not stop shouting “Pak Jokowi! Pak Jokowi! as the presidential entourage cars passed. They shouted along the way since Jokowi came out of hotel. Jokowi did not hesitate to approach the people and shake their hands. Former President Susilo Bambang Yudhoyono (SBY), in his capacity as the Chairman of the Global Green Growth Institute (GGGI), met President Joko Widodo (Jokowi) in Merdeka Palace Jakarta on Monday (8/12). On that occasion, they took the opportunity to discuss the Government Regulation in Lieu of Law (Perppu) on Elections of Regional Heads which was recommended to be rejected in the National Congress of Golkar Party in Bali a few days ago. According to SBY, he and President Jokowi took the same stance to support the Perppu on Elections of Regional Heads and to urge the enactment of the Perppu into a law. “Our stance is 100 percent the same,” he said. President Jokowi confirms government’s commitment in finishing human rights violation cases in the past. There are two possible ways could be done; reconciliation and court. “Two ways could be done in effort of human rights (HAM) enforcement, that are overall reconciliation and ad hoc court”, says Jokowi while giving speech at the World Human Rights Day of 2014 at the Presidential Palace in Yogyakarta, Tuesday (9/12) morning. President asserts the enforcement of HAM is not only about enforcing the law, but how the government could ensure the rights related with economy, social and culture, people rights to gain education and health, and also the rights to have protection in doing worship based on individual’s faith or belief. 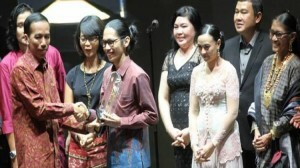 After visiting Pangkalan Bun in Central Kalimantan and Gorontalo, President Joko “Jokowi” Widodo acompanied by the First Lady Iriana Widodo continue their schedule to Palembang in South Sumatera to attend Indonesian Movie Festival (FFI) of 2014 at the Palembang Sport Convention Center (PPSC), on Saturday (6/12) evening. President Jokowi says he loves to watch Indonesian movie. “Do not be surprised, President Jokowi loves to watch Indonesian movie, you could possibly meet me at the cinema at 9 or 11 PM, Saturday night”, says Jokowi. In addition, he mentions few titles which he watched in recent months. 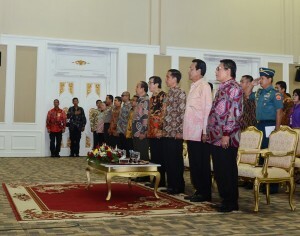 President Joko Widodo (Jokowi), in the State Palace Jakarta on Monday morning (8/12), handed over the Budget Execution Documents (DIPAs) for 2015 to ministers, heads of non-ministerial state institutions, and governors. Minister of Finance Bambang PS Brodjonegoro stated in his report that in the 2015 fiscal year, there are 22,786 DIPAs, the total values of which amount to IDR 647.3 trillion. Those DIPAs consist of 18,648 DIPAs of the central government’s working units (the values of which amount to IDR 627.4 trillion) and 4,139 DIPAs of regional governments’ working units (the values of which amount to IDR 19.9 trillion). 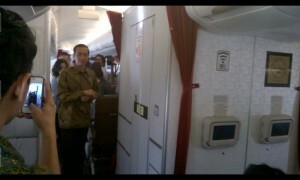 President Joko Widodo (Jokowi) on Tuesday (9/12) at 8:05 a.m flight to Yogyakarta with commercial aircraft Garuda Indonesia (GA) 204 from Soekarno Hatta Airport. In Yogyakarta, President Jokowi scheduled to attend the Commemoration of World Human Rights (HAM) Day 2014, held at the Presidential Palace of Yogyakarta at 10:00 a.m.
After attending Indonesian National Army’s (TNI AD’s) Unit Commanders Call 2014 in West Waringin Municipality, Central Kalimantan, on Friday afternoon (5/12), President Joko Widodo (Jokowi) together with First Lady Iriana Widodo and his entourage continued their working trips to Gorontalo municipality in Gorontalo Province, to open the National Working Meeting of the Indonesian Muslim Intellectuals Association (ICMI) 2014 (Silaknas ICMI 2014) on the evening of the same day. 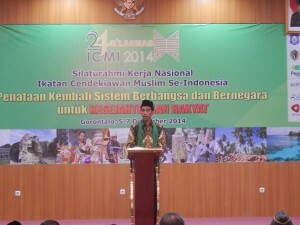 In front of the audience who crowded the grand hall of Gorontalo State University, President Jokowi welcomed positively the theme conveyed in Silaknas ICMI 2014, namely “The Nationhood and Statehood Systems Re-management for People’s Welfare.” In particular, in Silaknas ICMI 2011, ICMI already declared “Moral Advancement” which is actually similar to “Mental Revolution” promoted by President Jokowi. 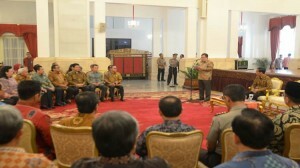 Vice President Jusuf Kalla evaluated that almost all sugar factories in Indonesia, the Dutch colonial heritages, have the same problems which are the ineffective and inefficient performances because of the inadequate supporting powers of production, therefore they gained sustainable loss instead of profit. For that reason, the government has a plan to revitalize them by building 10 new sugar factories Java Island to create the sugar self-sufficiency in the future. 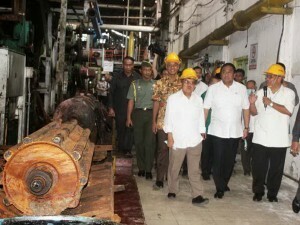 “Build 10 sugar factories in Java, then we will be self-sufficient,” Jusuf Kalla said it when he responded the presentation from the Main Director of PTPN IX Adi Prasongko in his visit to Mojo Sugar Factory in Sragen, Central Java, on Friday afternoon.